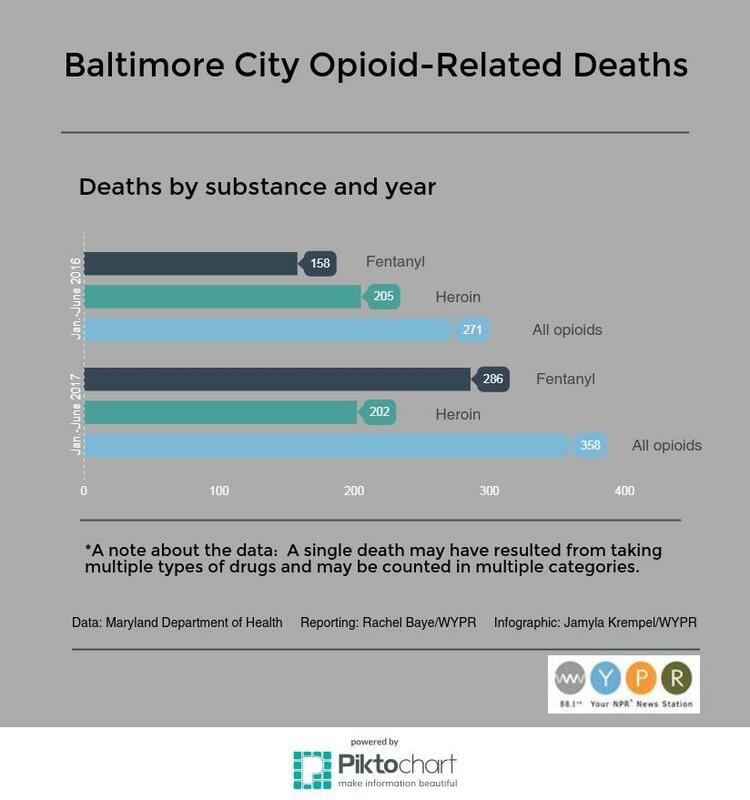 Opioid related deaths in Baltimore City. Baltimore City is suing a number of drug companies and distributors as well as two Baltimore County doctors for their alleged roles in the city’s opioid crisis. The city joins more than a hundred states and cities that have already filed lawsuits against the companies. WYPR City Hall Reporter Dominique Maria Bonessi talked with Nathan Sterner about the suit. NATHAN: Why is Baltimore jumping on the band wagon now to sue these companies? DOMINIQUE: As of last year 523 Baltimoreans have died from opioid overdoses and in the past decade there have been over 3000 overdose deaths. City Solicitor Andre Davis says he wants those allegedly responsible for the injuries and damage caused by “the fraudulent and reckless marketing of opioids” held accountable. NATHAN: Who are the players in this lawsuit? DOMIIQUE: So the city is the plaintiff and they are being represented by the Susman-Godfrey, a high-powered national law firm. And the defendants are a welter of drug manufacturers and distributors with all sorts of interlocking corporate ties. Purdue Pharma is the biggest one. And there are two Baltimore County doctors who run a pain management clinic in Towson. NATHAN: What is the city arguing against these big pharma companies? NATHAN: In total do we know how much the city is asking for in the lawsuit? DOMINIQUE: The suit doesn’t specify the amount of damages it seeks, but it asks the court to force the companies to cover the city’s costs in dealing with the crisis. That’s in line with what the other states and cities that have filed suits have done. We don’t know how much money exactly Baltimore city is suing for, but many cities and states like Baltimore report extenuating expenses for caring, treating, and burying those addicted to the drugs. Baltimore’s Health Commissioner Doctor Leana Wen has worked for years to curb the tide of addiction in the city. In previous interviews Dr. Wen has told me that a Narcan kit, or the drug to reverse an opioid overdose, costs anywhere between $20 to $40 per person. There are also additional costs for cities and states like supporting the children of those addicted and paying for paramedics, police, and city officials. The number of people in Maryland who died after taking the narcotic Fentanyl increased by more than 70 percent in the first half of 2017, compared with the first half of last year, according to preliminary data the state Department of Health released Tuesday. Deaths related to heroin and prescription opioids were relatively flat across the state, the data show.